Launch PowerApps Mobile when offline. Run apps that you develop when offline. Determine when an app is offline, online, or in a metered connection by using the Connection signal object. Use collections and leverage functions such as LoadData and SaveData for basic data storage when offline. LoadData and SaveData combine to form a simple mechanism to store small amounts of data on a local device. By using these functions, you can add simple offline capabilities to your app. These functions are limited by the amount of available app memory because they operate on an in-memory collection. Available memory can vary depending on the device, the operating system, the memory that PowerApps Mobile uses, and the complexity of the app in terms of screens and controls. If you store more than a few megabytes of data, test your app with expected scenarios on the devices on which you expect it to run. You should generally expect to have between 30 and 70 megabytes of available memory. The functions also don't automatically resolve merge conflicts when a device returns to connectivity from offline – configuration on what data is saved and how to handle reconnection is up to the maker when writing expressions. We're working to expand the capabilities for offline scenarios. Stay tuned here and on the PowerApps blog for updates when they become available. The first thing to think about in offline scenarios is how your apps work with data. 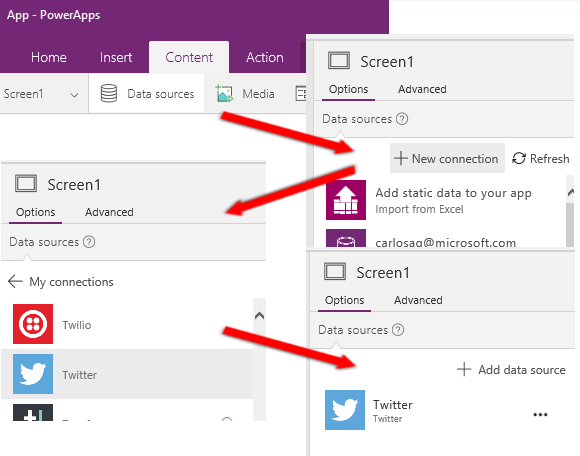 Apps in PowerApps primarily access data through a set of connectors that the platform provides, such as SharePoint, Office 365, and the Common Data Service. You can also build custom connectors that enable apps to access any service that provides a RESTful endpoint. This could be a Web API or a service such as Azure Functions. All these connectors use HTTPS over the Internet, which means your users must be online for them to access data and any other capabilities that a service offers. One of the most interesting aspects of PowerApps is its set of capabilities and formulas that enable you to filter, search, sort, aggregate, and manipulate data in a consistent way regardless of the data source. Sources range from in-memory collections in the app, to SharePoint lists, to SQL databases and the Common Data Service. This consistency enables you to easily retarget an app to use a different backend. More importantly here, it also enables you to use local collections for data management with almost no changes to an app's logic. In fact, local collections are the primary mechanism for handling offline data. To keep the focus on the offline aspects of app development, we'll show you a simple scenario focused around Twitter. We'll build an app that enables you to read Twitter posts and submit tweets while being offline. When the app comes online, the app posts tweets and reloads the local data. If the device is online, we access the Twitter connector directly to fetch data, and populate a collection with that data. If the device is offline, we load the data from a local cache file using LoadData. We enable the user to submit tweets - if online we post directly to Twitter and refresh the local cache. We post any tweets that we have in the local cache. We refresh the local cache and save it using SaveData. 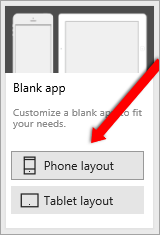 Click or tap New > Blank app > Phone layout. Click or tap Content > Data sources, then choose Add data source on the Data sources panel. Click or tap New Connection , select Twitter , and click or tap Create. Enter your credentials, and create the connection. 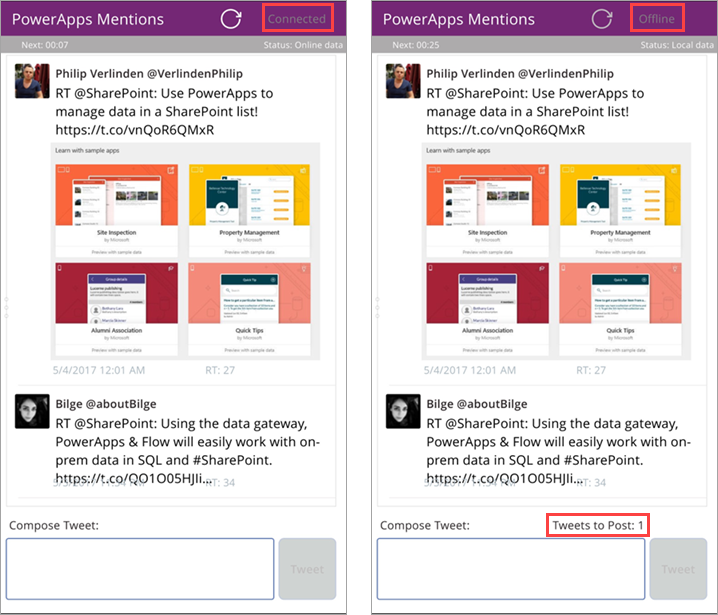 If the device is online, it loads into a LocalTweets collection up to 100 tweets with the search term "PowerApps". If the device is offline, it loads the local cache from a file called "Tweets," if it's available. Insert a new flexible height gallery: Insert > Gallery > Blank flexible height. Set the Items property to LocalTweets. Add an Image control, and set the Image property to ThisItem.UserDetails.ProfileImageUrl. This formula checks if the device is online. If it is, the text of the label is "Connected", otherwise it's "Offline". Insert a new Text input control named "NewTweetTextInput". Set the Reset property of the text input to resetNewTweet. Add a Button control, and set the Text property to "Tweet". If the device is online, it tweets the text immediately. If the device is offline, it captures the tweet in a LocalTweetsToPost collection, and saves it to the app. Then the formula resets the text in the text box. Set the Duration property to 300000. Set the AutoStart property to true. This formula checks if the device is online. If it is, the app tweets all the items in the LocalTweetsToPost collection. Then it clears the collection. Now that the app is finished, let's check out how it looks before we move on to testing. On the left, the app is connected; and on the right, it's offline, with one tweet ready to post when it's online again. Run PowerApps on a mobile device while online. You must run an app at least once while being online, so you can download the app to the device. Notice that the tweets are loaded, and that the status shows Connected. Set the device to airplane mode to ensure that it's offline. Run PowerApps. You can now run the Twitter app offline, and you have access to any other apps that you have previously run on this device while online (i.e. PowerApps hides any apps that haven't yet been downloaded to your device). Notice how it correctly reflects the connection state, with a status of Offline. Write a new tweet. It will be stored locally in the LocalTweetsToPost collection. Exit airplane mode. After the timer triggers, the app posts the tweet. We hope this article gives you an idea of the capabilities that PowerApps has for building offline apps. As always, please provide feedback in our forum and share your examples of offline apps in the PowerApps community blog.